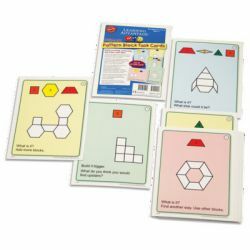 This colorful set of pattern block activities stimulates children to think about colors, shapes, and patterns! Engage them in hands-on learning involving counting, one-to-one correspondence, building and extending patterns, and spatial problem solving. Because color and shape have such universal presence in the real world, children deserve every possible opportunity to interact with them. Help young learners to become curious about geometry and its role in their lives. Each set contains 24 cards.